Her Majesty the Gyaltsuen launched the Khesar Gyalpo University of Medical Sciences of Bhutan, this morning. 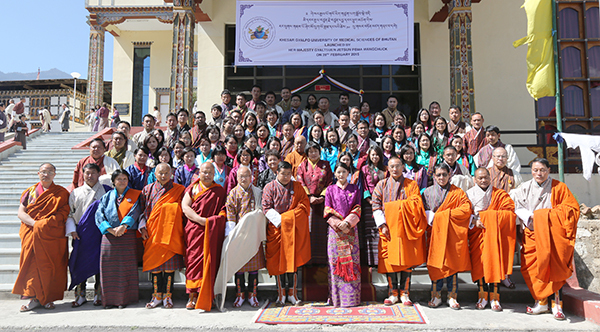 The Khesar Gyalpo University of Medical Sciences of Bhutan is an autonomous university mandated with the conduct of education and training programme in medical and health sciences. The Academic Strategic Vision 2030 of the university was also released, today. The Faculty of Nursing and Public Health, formerly known as the Royal Institute of Health Sciences, Faculty of Traditional Medicine, formerly known as the National Institute of Traditional Medicine and the Postgraduate Medical Education Centre are the institutes affiliated to the university. Also, the only private health institute in the country, Reldri Academy of Health Sciences in Phuentshogling is also affiliated with the Khesar Gyalpo University of Medical Sciences of Bhutan.